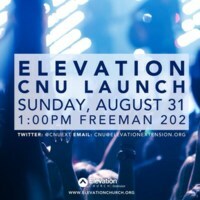 Elevation Church CNU Extension code. Join us on Sunday at 1:00PM in Freeman 201! Loud music, FREE Tshirts, and an awesome community!